Dimensions: 93 × 25 × 21 mm. Gross weight - 0.14 kg. The ideal power bank for women, are small, are lightweight, are perfect for handbags. You can choose from many colors, you can always match such energy banks, for example, shoes or handbags. This device has a monochrome, alphanumeric display. The display shows the percentage of energy in the mobile charger. With this solution you always have the ability to control. 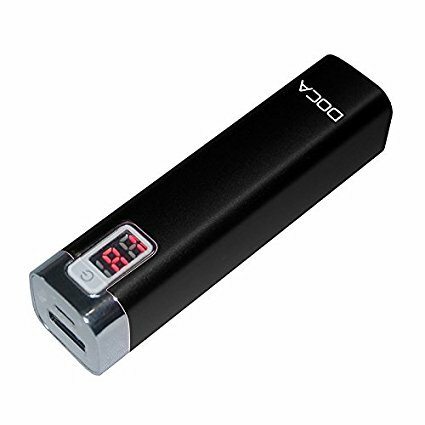 The battery in this device is of low capacity, which is 2600 mAh. Because it is a device with very small capacity, the power bank itself is very light. The net weight of this device is about 0.09 kg, the small dimensions here are an additional asset. Unfortunately, there is something here in life. Small dimensions and small weight means a small battery, which in turn means small capacity. At present, the average mobile phone has a battery of such capacity, that is, a portable charger, it can be used for so-called emergency charging. You will not have any problems right now, if you suddenly run out of energy on the phone and you have to call somewhere or check something online. Power banks is a device that in addition to charging the phone can also power other electronic gadgets. One such electronic device may be a digital camera. People who are professionally involved in photography have come to grips with the situation when they have run out of energy at some stage in their work. You must have professional equipment to power the camera, then you can focus on the work, that is, making great photographs. Powerbanki is a device that loads great not only phones, tablets, mp3, mp4 or mp5, but also supplies digital cameras. Choose professional equipment to make sure these devices will not disappoint you in difficult situations. If you are not satisfied with our power banks you can always return them within 30 days. Here you will find more information about energy banks.